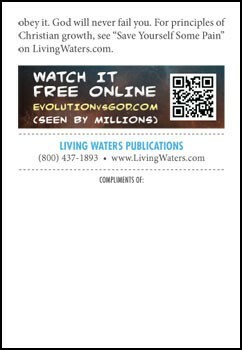 This tract show the belief in Darwinian evolution to be unscientific and based on blind faith. 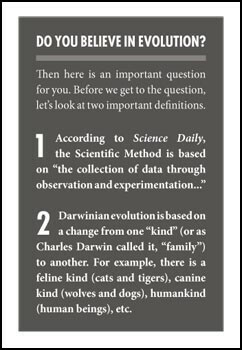 So here’s the question: Can you name any observable evidence for Darwinian evolution that meets the requirement of the Scientific Method? Something that can be observed directly here and now, that doesn’t require some element of blind faith? Perhaps you are thinking of “Darwin’s finches,” with different size beaks that developed over time. But that’s not molecules-to-man evolution; that’s simply what’s called natural selection, or adaptation, as different species of finches developed— depending on which combination ofexisting genetic information was most suitable in particular environments. Such adaptation happens everywhere in nature, but it’s always within the limits set by the genetic code, based on the information it already contains. Darwin’s finches remain as finches; there’s been no change of kind. Then there are fossils. 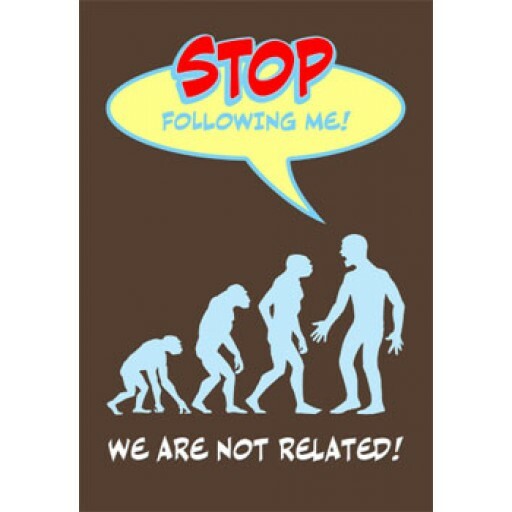 You may line them up according to similarities and claim that they prove common descent, but that interpretation falls outside the realm of observational science. Because you cannot directly “observe” something that happened in the past, it requires a measure of faith. 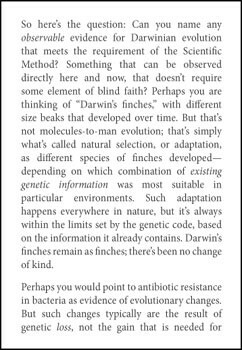 Darwinian evolution doesn’t pass the test for the Scientific Method—it is unobservable. Darwinian evolution is therefore not scientific. 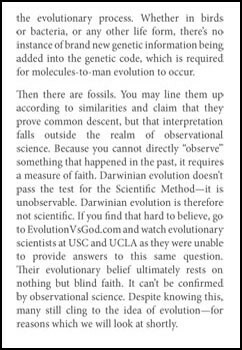 If you find that hard to believe, go to EvolutionVsGod.com and watch evolutionary scientists at USC and UCLA as they were unable to provide answers to this same question. Their evolutionary belief ultimately rests on nothing but blind faith. It can’t be confirmed by observational science. Despite knowing this, many still cling to the idea of evolution—for reasons which we will look at shortly. The biblical creation model, on the other hand, can be confirmed by observational science. You can observe every animal bringing forth after its own kind (as it says in the book of Genesis). Despite the tremendous variety God programmed into their DNA, enabling creatures to become adapted to their environments, dogs remain dogs, cats remain cats, etc. Nothing changes kinds throughout the 1.4 million different species of animals, birds, insects, and fish. That is observable both in the fossil record and in the living world today. 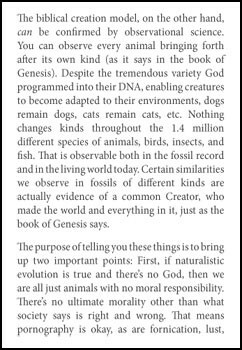 Certain similarities we observe in fossils of different kinds are actually evidence of a common Creator, who made the world and everything in it, just as the book of Genesis says. 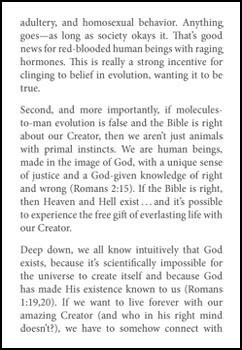 Second, and more importantly, if molecules-to-man evolution is false and the Bible is right about our Creator, then we aren’t just animals with primal instincts. We are human beings, made in the image of God, with a unique sense of justice and a God-given knowledge of right and wrong (Romans 2:15). If the Bible is right, then Heaven and Hell exist . . . and it’s possible to experience the free gift of everlasting life with our Creator. Deep down, we all know intuitively that God exists, because it’s scientifically impossible for the universe to create itself and because God has made His existence known to us (Romans 1:19,20). If we want to live forever with our amazing Creator (and who in his right mind doesn’t? ), we have to somehow connect with Him—the Source of all life. The problem is that we are separated from Him by our sins. Let’s see if we have sinned, by looking briefly at the Ten Commandments (God’s moral Law). Have you ever told a lie, stolen anything, or used God’s name in vain? Jesus said, “Whoever looks at a woman to lust for her has already committed adultery with her in his heart.” If you have done these things, God sees you as a lying, thieving, blasphemous, adulterer at heart, and the Bible warns that one day God will punish you in a terrible place called Hell. But God is not willing that any should perish (2 Peter 3:9). God, who is “rich in mercy,” sent His Son, Jesus, to suffer and die on the cross in the place of guilty sinners. Sinners broke God’s Law, but Jesus paid their fine. 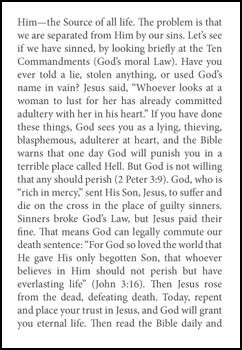 That means God can legally commute our death sentence: “For God so loved the world that He gave His only begotten Son, that whoever believes in Him should not perish but have everlasting life” (John 3:16). Then Jesus rose from the dead, defeating death. Today, repent and place your trust in Jesus, and God will grant you eternal life. Then read the Bible daily and obey it. God will never fail you. For principles of Christian growth, see “Save Yourself Some Pain” on LivingWaters.com.